Lisa loves John: 2016 Shenanigans! It looks like you guys had a ton of fun with your family in town! Those tornado fries looked delicious!! How nice that you had your family and friends come visit! Is there anything better?! It looks like you had a great time! I haven't heard of that game your brother got you... we love board games, so I need to check that one out. It looks like y'all had the best time!! We love Pandemic, it's such a fun game! Happy New Year love! Tornado fries? How have I never heard of these? What a fantastic way to bring in 2016!! Y'all got a lot of adventures in while your family was visiting! So glad you've had visitors to make it feel more like home! 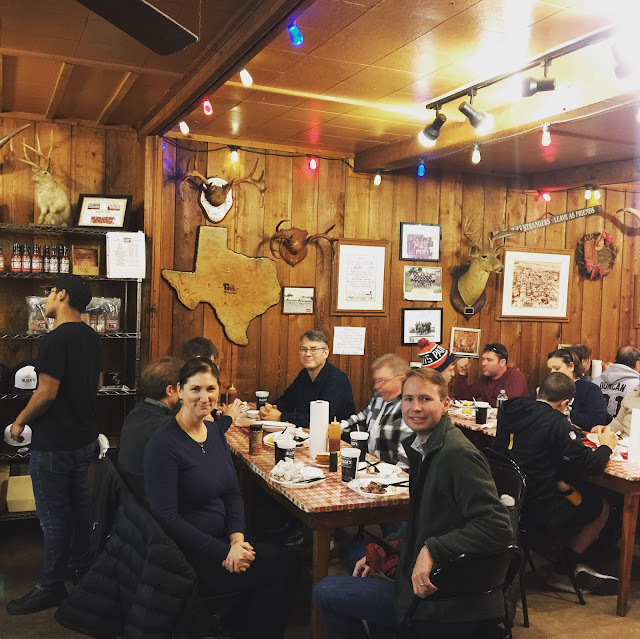 It sounds like you had an amazing visit with your family with some great stops in the Texas Hill Country! That BBQ sounds amazing, and the ice cream looks so delicious! I've never heard of the Pandemic board game, I'll have to look it up. Sounds like a great way to bring in the new year! That BBQ place must be amazing!! So much fun! I'm definitely going to need to try those tornado fries!! Did you like Pandemic? My husband and I have been looking at that and just couldn't fathom paying that price unless we knew it was fun. WOW! Y'all did a lot! I didn't know y'all went to Black's! Kevin and I went there a few months ago because we heard it was good. I remember really liking it, but liking Salt Lick even better :) Tornado fries?! Yum! Where was that? How fun are you guys!! Looks like a great time with family! Those tornado fries look pretty interesting! Haha. Girl...y'all were busy! But it looks like such a great visit!